This small work is a look at baptism by differing denominations within Christendom. "Unto what then were ye baptized?" (Acts 19:3). Christian Baptism is not the celebration of a religious rite by modes indifferent; but a speck act to be administered by a speck body, to persons professing speck qualifications, for the profession of speck truths. When one of these properties is wanting, the transaction is "null and void," since, unless the ordinances are observed as Christ commanded, they are not kept, but perverted, and bring upon the parties not the commendation, but condemnation, of the Master. The Divine Institutor of the rite selected but one word to indicate the act he designed to be observed, and that word—baptizo—which never had but one meaning, when referring to persons, viz. : "To dip in or under water," and therefore immersion in water was the act he expressly commanded, and thereby as expressly forbade any other act to be performed in his name for Christian baptism. It is admitted by all that a Scriptural church is the only organization he authorized to administer this rite; and it is a notable fact that all the most eminent Pedobaptist scholars of both continents freely admit that there is neither precept nor example in the Scriptures for the administration of baptism to any other than to those who give credible evidence of repentance toward God and faith in our Lord Jesus Christ; while some, whose scholarship can not be doubted, frankly admit that the baptism of unbelieving children is not only not justified by the Scriptures, but utterly opposed to the genius of the gospel, and the fundamental principles of the New Testament. It only remains to ascertain what are the specific truths or facts Christian baptism was instituted to express, and this is what I propose to do in this discourse. That baptism was instituted by Christ for some definite purpose all denominations admit. That it is for the profession of something on the part of the subject is not only set forth by all Catholic and Protestant creeds, but must be the conviction of every reader of the Scriptures. The question of Paul to the twelve disciples, at Ephesus, which I have chosen to discuss, clearly supposes this. 1. The proper authority. No one but John was authorized to administer his baptism; and he certainly authorized none of his disciples to baptize. 2. They were evidently unregenerate, and therefore disqualified to receive Christian baptism. 3. They did not profess the proper faith in their baptism. Paul therefore rightly instructed and baptized them. 1. That persons may be immersed, and yet not have received the Christian immersion. 2. That they may be immersed by an administrator who had himself been immersed, and yet not obey Christ in the act. 3. That persons may have been immersed, and satisfied with their baptism, and yet not have received Christian immersion or baptism. 4. That unless professing the proper qualifications, and professing the proper faith, an immersion by even a proper authority is null and void. This example is positive instruction to the churches in all subsequent ages to re-administer the act, where there has been an irregularity, which is nothing less than a violation of the law governing the ordinance. The church at Corinth conscientiously believed they were correctly administering the Lord’s Supper, while they were shamefully perverting it, and making themselves "guilty of the body and blood of the Lord Jesus" (1 Cor. 11:17). Now that Christian baptism has been and still is regarded as the act, on the part of the subject, of professing the faith of the church baptizing, whether true or false, is proven by the fact that from the third century onward the "catechumeni"—those under course of instruction for baptism—were required to repeat the creed of the church, and then the question was invariably asked: "Wilt thou be baptized into this faith?" i.e., do you desire to profess that you receive to hold and rest your salvation upon it? Only upon the candidate answering, "I will," was baptism administered. Even when those post apostolic churches that perverted the rite of baptism to a "sacrament" and "seal" of salvation, and administered it to unconscious infants to secure their salvation, sponsors and godfathers and mothers were invented to answer for the speechless babe. "Dost thou believe all the articles of the Christian faith as contained in the Apostles’ Creed?" The sponsor answers (for the infant), "I do." "Wilt thou be baptized in this faith?" Sponsor (for infant), "That is my desire." "Baptism is a sacrament instituted by Christ to wash away original sin, and all those we may have committed; to communicate to mankind the spiritual regeneration and grace of Jesus Christ, and to unite them to the living head. If any man shall say that baptism is not essential to salvation, let him be accursed. In baptism, not only our sins are remitted, but all the punishment of sins and wickedness. "—Council of Trent. It is into this faith, and to secure the remission of sins, that every one who receives the rite from the Catholics is baptized. The earliest perversion of the primitive faith touching this ordinance was by an inversion of the Scriptural order, placing the water of baptism before the blood of Christ, and thus making it necessary to reach the blood that cleanseth from all sin through the water of baptism. This change corrupted the whole gospel, and effectually subverted the whole plan of salvation, and made regeneration depend upon the will of men—the priesthood. A person baptized into this faith, and for this purpose, though immersed by Protestants or Baptists could not be considered scripturally baptized. The Faith of the Campbellites. "In and by the act of immersion, as soon as our bodies are put under the water—at that very instant—all our former or old sins are all washed away."—Ch. Bap., p.100. "Immersion is the means divinely appointed for the actual enjoyment of the first and greatest blessings."—Mill. Har. "Remission of sins can not be enjoyed by any person before immersion." "Belief of this testimony is what impelled us into the water, knowing that the efficacy of his blood is to be communicated to our consciences in the way which God has pleased to appoint; we stagger not at the promise, but flee to the sacred ordinance [water] which brought the blood of Jesus in contact with Our consciences. Without knowing and believing—this, immersion is as a blasted nut—the shell is there, but the kernel is wanting."—Ch. Bap., p. 521. The standard writers of the "Disciples," M. E. Lard, Benj. Franklin, Dr. Hobson, of this day, perfectly accord with Mr. Campbell in teaching that baptism is in order to the remission of sins. We see that the Campbellites baptize into the self-same faith that the Catholics do. Mr. Campbell asserts, with all the force he can give his language, that the sinner can only come to Christ "Through the water;" that he can only reach the blood of Christ by being immersed into the water, and without the candidate knows and believes this, and receives the rite to secure this, his baptism is "as a blasted nut!" This sect, therefore, unite with the teachers of an apostate Christianity in placing the water before the blood, thus bringing an unpardoned, unregenerate sinner to water baptism as the sacrament of salvation. Surely no church of Christ can indorse this pernicious doctrine, by receiving those immersed by Catholics or Campbellites as Scripturally baptized without rejecting the faith of the gospel. That the Protestant Episcopal branch baptizes into the same faith as its parent body—the Catholic—her own standards attest and her scholars freely admit. Ques. —"Who gave you this name?" Ans. —"My sponsors in baptism, wherein I was made a member of Christ, a child of God, and an inheritor of the kingdom of heaven." All adults as well as infants who receive the baptism of this church are properly baptized into that state of pardon, regeneration and salvation. Mellville, the distinguished preacher of that church, says: "I do not see how I can be commonly honest and yet deny that every baptized person is on that account regenerate." Many come to us from the Methodist denomination, and let us seek from them the answer to the question: "Into what faith do they baptize?" Mr. Wesley, who asserted that he was the father and founder of the whole system, says: "It is certain that our church supposes that all who are baptized in their infancy are at the same time born again." "If infants are guilty of original sin they can not be saved in the ordinary way, unless this be washed away by baptism." Into what do Methodists baptize adults?" "By baptism we, who are by nature children of wrath, are made the children of God. . . In all ages the outward baptism is a means of the inward. . . By water then, as a means—the water of baptism—we are regenerated or born again." —Wesley’s Works, vol. 6, sec. 4. The last Methodist Conference that met in Memphis, Tenn., in an official report condemned the growing practice of baptizing persons upon a profession of regeneration as an evil! I quote a paragraph: "Baptism, too, has been unnecessarily deferred, not only in case of children, but sometimes postponed to an indefinite period in the case of adults. The practice of requiring a public profession of regeneration before baptism has resulted in evil, and that the design of the sacrament is perverted, and the people encouraged to expect the divine blessing without the use of the means [i. e., baptism]. We call attention to these evils that we may seek diligently to remove Western Methodist. It is a fact, the truth of which every one can easily satisfy himself about by examining the Methodist Ritual for the baptism of adults, that no regenerate person can be baptized according to its teachings. Every adult, without exception, is required to profess himself an unregenerate, unpardoned sinner, and that he comes to baptism to obtain remission of sins and regeneration of heart, and he is baptized in the hope of obtaining these. You have very properly decided that immersions into such a faith, by Baptist churches, would be worse than null, since the subject would profess a false and pernicious faith; and such baptisms, if they could be so called, would only introduce professedly unregenerate adults into the church, and aid in deceiving them to their own ruin. Ques. —"What is a sacrament?" Ans. —"A sacrament is a holy ordinance instituted by Christ, wherein i.e., in the receiving of which, by sensible signs, Christ and the benefits of the New Covenant are represented, sealed and applied to believers." It is evident that the Covenant of Grace is worthless to any one, unless sealed and applied to him. Therefore, unless the sacraments are received, none of the benefits of Christ’s death can be enjoyed by any one. This is clear. Ques.—"Now what ordinances are sacraments wherein, or by and through which, alone the benefits of Christ’s death are enjoyed?" Ans.—"The Sacraments of the New Testament are baptism and the Lord’s Supper." Ans.—"Baptism is a Sacrament of the New Testament, wherein Christ hath ordained the washing with water in the name of the Father, and of the Son and of the Holy Ghost, to be a sign and seal of the engrafting into himself, of remission of sins by his blood, and regeneration by his Spirit, of adoption, and resurrection unto everlasting life." Dr. Hodge, of Princeton, says: "We are baptized in order that we may be united to Christ, and be made partakers of his benefits. This baptism unto repentance is a baptism that the remission of sins may be obtained." "The Church [Presbyterian makes us Christians by the sacrament of holy baptism, which she always held to be of supernatural force for that very purpose." —See Pritchard, p. 124. We now inquire, Into what do Baptist churches baptize? "A third work of Anti-Christ consists in this, that he attributes the regeneration of the Holy Ghost unto the mere external act—baptizing infants into the faith, teaching that thereby regeneration must be had; on which principle he bestows orders, and, indeed, grounds all his Christianity, which is contrary to the word of the Holy Scriptures." 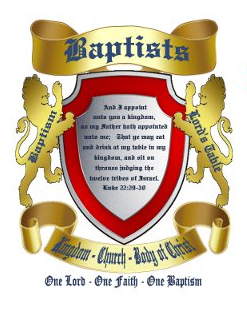 Can it be that there is a Baptist church in this age that will condemn the decision of the martyr Baptists of the twelfth century, and approve and indorse the baptismal acts of those sects that hold and teach baptism for regeneration by receiving them as valid? Article 7. —"We believe in the ordinance of baptism. The water is the visible, external, which represents to us that which, by virtue of God’s invisible operation, is within us, viz. : the renovation of our minds, and the mortification of our members through faith of Jesus Christ; and by this ordinance we are received into the holy congregation of God’s people, previously professing and declaring our faith and change of life." It is certain that no Catholics or Protestants ever held or taught such sentiments as these but this design of baptism Baptists alone hold and teach today. It is the characteristic doctrine that distinguishes us from all other denominations. Now to develop more clearly the work or righteousness of Jesus Christ, upon which our faith takes hold and rests, I point you to the baptism of Christ himself. He is our great exemplar, as well as teacher; and he not only determined the act by his example, but he expressly declared the profession we should make, and the belief into which we should be immersed. He declared that his own baptism was in souse sense "to fulfill all righteousness," and we may say our baptism is to do the same thing in tire same sense. We know Christ was not baptized "in order to the remission" of his sins—"to wash away" his sins—for he was "holy, harmless, undefiled, and separate from sinners;" nor are we to come to the water for any such purpose, for we are not warranted to come until we have been washed in his blood, which cleanseth from all sin. Therefore we have no sins for water to cleanse, if it had cleansing power. We come not to the water for pardon, but with pardon—with the sweet consciousness of pardon in our hearts. Nor did Christ receive the "seal" of any covenant; for "him God the Father," not John the Baptist, "sealed." No more is it a seal of the covenant of grace to us, for the Holy Spirit distinctly teaches that we are "sealed by the Holy Spirit" the moment we believe, and never before. "In whom, after that ye believed, ye were sealed by the Holy Spirit," etc. (Eph. 1:13). Nor was Christ baptized to induct him into his priestly office, as so many falsely teach; for—(1) John had no authority to make a high priest; (2) No one could induct a high priest into office at the Jordan, and by immersing him; (3) Christ came not of the tribe to which belonged the priesthood; nor, (4) Was Christ made a priest by any law of carnal commandment, as Jewish high priests were made? Will those who have believed this stop and think, for one moment, what the fearful conclusion must be? No one could have been saved until Christ was truly made a High Priest—"inducted into his office;" and therefore this theory inevitably consigns the whole human family to helpless and hopeless perdition, up to the very hour John baptized Christ, leaving the world for four thousand years without a Savior! The covenant of grace had no retrospective force or efficacy—only prospective. Let us clearly understand for what purpose Christ was baptized in the river of Jordan. He came to earth to work out a perfect righteousness for his people—to satisfy the infinite claims of divine justice for all who would that grace receive. It was this "all-righteousness" he declared he wished to fulfill in his baptism. This he evidently could not literally accomplish by being baptized, else he might have ascended from the water in a chariot of glory to the right hand of the Father. But if he did fulfill the "all-righteousness" he came to earth to accomplish, he must have done it figuratively. We know that it was in a figure he fulfilled it; for the Holy Spirit expressly declares that the rite of baptism is only a figure—"The like figure whereunto baptism doth now also save us." If baptism is only a figure, whatever it is said to do, or we are said to do in or by it, must be done figuratively. If it saves us, it saves us figuratively. If it washes away our sins, it does it figuratively, i.e., declaratively. If we are by it baptized into Christ, it is done figuratively, as the Jews were into Moses. If we are baptized into his death, we only.1gurc, symbolize it. So if Christ did in his baptism, fulfill all righteousness, he must, he could only have prefigured the acts which constitutes the all-righteousness. He set before their eyes, in a vivid figure, the three great acts by which he did fulfill the "all-righteousness" the law required in order that those for whom he appeared might be set free from the divine law, and their redemption eternally secured. 1. The law required the death of the transgressor, and Christ must therefore sink under the stroke of death for them. The penalty of sin, threatened to the first Adam, was borne by the second, "the Lord from heaven," not by his mere humanity, in which he was made manifest to us. That penalty was death, not mere physical, but spiritual, death, i.e., separation from God, the withdrawing of God from the soul. Physical death and all our sorrows are but the inseparable consequences of God’s favor withdrawn from us. It is sin that separates between us and God. "But your iniquities have separated between you and your God, and your sins have hid his face from you, that he will not hear" (Isa. 59:2). It was upon our divine Redeemer, who alone was able to bear them, that all our sins were laid, and thus "he was made sin for us who knew no sin, that we might be made the righteousness of God in him." It was for this cause the Father hid his face from his Divine Son. It was the second Adam—the Lord from heaven, not the mere fleshly tabernacle in which his divinity was veiled—that suffered this infinite penalty. It was none other than the second Person in the Godhead, who, before the foundations of the earth were laid, covenanted with his Divine Fellows to satisfy by suffering all the demands of the divine government, to be a Mediator, that he might be the Redeemer of his people. It was therefore the Fellow, a coequal Person in the Godhead, whom the Father commanded the sword of justice to smite. It was that fiery two-edged sword, bathed in the wrath of an incensed God, due to our sins, and the averted face of his Father, which extorted that fearful cry: "My God, my God, why hast thou forsaken me? "—a cry that struck the banners of heaven at half-mast, rent the solid rocks of Calvary; a cry whose echo still reverberates over a lost world today, arresting the attention, and drawing, by its wondrous power, all men unto the Cross. It was he who made the worlds who yielded up his spirit and sank in death to save us from death. To gaze upon, in dark Gethsemane? Because Thou lovedst even to the end! Unmeasured as the fiery depths it passed? Seal Thou my quivering love forever unto Thee! 2. But Christ had more than to suffer the infinite penalty of violated law, and sink in death under its direful curse; more than merely to make satisfaction for sin, in order to redeem us. The fiery sting of Death had to be extracted, the dread power of the grave had to be vanquished, and a way prepared for the release of its captives from its darkness and hopelessness. It must not be lost sight of that Christ, in the Covenant of Redemption, engaged to redeem our bodies from the power of the grave, as well as our souls from endless death. For four thousand years Death, seated upon his throne of human skulls, had reigned undisputed monarch over Adam’s whole race—king of terrors, and the terror of kings. Into his subterranean empire of eternal silence, into which no ray of light or hope had ever dawned, he had dragged down the generations of the living, and ground them into dust at his feet. 3. He must needs rise from the dead. "He rose," says the apostle, "for our justification." He had engaged, in everlasting covenant, to rescue his people from the power of the grave. While the claims of the divine law were unsatisfied, no power in heaven could, in equity, open that prison-house, or allow a prisoner to go free. Christ’s release was a proof that he had discharged all claims against all believers. His resurrection from the dead was therefore an earnest of our own. As certainly as he rose, his people are free from the dominion of law, the power of the grave, and they will rise from the dead also. Thus, then, did he, by his baptism, prefigure these three acts, which Paul says constitute the gospel by which we are saved, and thus in figure did he "fulfill all righteousness." And angels saw him bathed in blood." I can not have mistaken His meaning, for He himself called his crucifixion a baptism—"I have a baptism to be baptized with, and how am I straitened until it be accomplished?" (Luke 12:50). Christ, then, in a lively figure, set before the eyes of all his sacrificial work—the ground of our salvation. He also declared to the Galatians that Christian baptism was a figure—picture—of the crucifixion of Christ; that in witnessing baptism they had, in a figure, seen Christ crucified. "O foolish Galatians! who hath bewitched you, that ye should not obey the truth, before whose EYES Jesus Christ hath been evidently set forth [literally, represented] crucified among you?" (Gal. 3:1). The reader will notice that the crucifixion had been represented to their eyes, not to their ears, and, therefore, it must have been by some figure, and not by words. In their own and in every baptism they had witnessed, the crucifixion of Christ had been evidently set forth before their eyes in a figure. All other ground is sinking sand." I ask you, my Christian brother or sister, who have never represented in your baptism the death, burial and resurrection of your Redeemer, is it too much for Christ to require of those whom he died to save, to represent the great acts of his redemptive work, and profess their own personal faith in, and conscious salvation by them as they enter his church on earth? The soul redeemed by his precious blood will rejoice to do it, despite the sneers of an ungodly world. It sees in it a sublimity and a grandeur beyond a mere mortal’s comprehension ! It glories in the privilege of representing before the eyes of the world the "all righteousness" of its Savior; of setting forth the crucifixion, and thus preaching the gospel of Christ to all beholders. This, be assured, is the baptism into which Christ commanded his church to baptize, and by the institution of this he forbade us to observe or to recognize any other. 1. Baptism is in no sense a "sacrament," or means of securing the grace of remission of sins, or regeneration of heart. (a) We can see, therefore, to baptize the unregenerate, to obtain for them spiritual regeneration and salvation, is to pervert the gospel to the subversion of men’s souls. "Infant baptism is utterly opposed to the fundamental principles of the New Testament." 2. We see that baptism can not be "the law of pardon," nor the act that unites the soul to Christ. Faith, and faith alone, independent of ail overt acts, unites to Christ, and secures our justification before God. "Being justified freely by his grace, through the redemption that is in Christ Jesus" (Rom. 3:24). Therefore we conclude that a man is justified by faith without deeds of law. To faith, as the medium of salvation, nothing can be added without destroying the whole scheme of salvation. "Christ has become of none effect unto you, whosoever of you are [or seek to be] justified by law [the law of pardon or any other law], ye are fallen from grace" (Gal. 5:4). The "all righteousness" of Christ is the only efficient, and faith the only instrumental, cause of our salvation. Neither Baptism, nor any other rite or ordinance, is a means in order to this end (Rom. 10). "For Christ is the end of the law for righteousness to every one that believeth. For Moses describeth the righteousness which is of the law, that the man which doeth those things shall live by them. But the righteousness which is of faith speaketh on this wise, Say not in thine heart, Who shall ascend into heaven? (that is, to bring Christ down from above:) Or, Who shall descend into the deep? (that is, to bring up Christ again from the dead.) But what saith it? The word is nigh thee, even in thy mouth, and in thy heart that is, the word of faith, which we preach That if thou shalt confess with thy mouth the Lord Jesus, and shalt believe in thine heart that God bath raised him from the dead, thou shalt be saved. For with the heart man believeth unto righteousness; and with the mouth confession is made unto salvation. For the Scripture saith, Whosoever believeth on him shall not be ashamed." 3. Nor is it by baptism that we become the children of God. "For we are all children of God by faith in Christ Jesus" (Gal. 3:26). 4. Nor is baptism the seal of the Covenant of Grace. "In whom (Christ) also after that ye believed, ye were sealed by that Holy Spirit of promise" (Eph. 1:13). 5. We also see that baptism does nothing toward cleansing the soul from the guilt, or securing the remission, of sin. The blood of Christ alone does this. "The blood of Jesus Christ his Son cleanseth us from all sin" (1 John 1:7). To say that something must be added to his blood, is to say that his blood alone is not sufficient, which is to profane it. While false religions direct the sinner to water for his cleansing, the Holy Spirit, by all the types, and the evangelists and apostles in all their writings, point us to the blood of Christ alone, by which we have peace, and by which our consciences are purified from dead works, and by which we have access unto God. 6. Nor are we anywhere in God’s Word taught that we come to this blood of Christ through water, but by faith alone. "Whom God hath set forth to be a propitiation through faith in his blood, to declare his righteousness for the remission of sins that are past" (Rom. 3:25). 7. We learn the great central truth, that, in the plan of salvation, the blood of Christ must, in every case, be applied to the conscience before water is applied to the body. It is Blood before Water. All the types of the Old Testament, referring to remission of sin, teach this. All the teachings of Christ assert this. The teachings of the apostles establish this: "Having your hearts sprinkled from an evil conscience, and our bodies washed in pure water, let us hold fast the profession of our faith" (Heb. 10:22). The unbroken practice of the apostles confirm this as the divine order. This is the grand and distinguishing test of genuine Christianity. It teaches the sinner to come to the water through blood—to the church through Christ; and not through water to blood, or through the church to Christ. This is the vital saving doctrine that distinguishes us as Baptists from all other denominations. We put blood, in every case, before water. All others put water before the blood. We do not teach that baptism is essential to salvation, but that salvation is essential to baptism. To those who have never been baptized into the faith of the gospel—have never professed a correct faith, or professed no faith—let me, in all affection and earnestness, beg and entreat you to seriously and prayerfully think on these things. Will you not, as you love your own souls, and as you hope you love Christ, carefully examine the New Testament, and learn for yourselves what Christ requires of you as the act and the profession of baptism? Do not fail to do it; do not refuse to do it, and still hope to be saved. Not because there is any saving merit in the act of baptism; not that it is "a sacrament of grace and salvation," for it is not; but because an aversion to know and do the will of Christ should be an all-convincing proof to you that your heart is not right in the sight of God. Can you hope to be saved while you openly contemn the authority of Christ, and reject the counsel of God against your own soul? Your neglect of Christian baptism will not, on its own account, condemn you; but it certainly will be indicative of the state of your heart. Your persistent disobedience is certainly evidence against you. Christ says: "If a man loves me, he will keep my commandments." Your inexcusable neglect and disobedience declare you not the friend of Christ. It may be that you are willing to wear the name, but unwilling to bear the cross of Christ. Can you then be his disciple? "And he that taketh not his cross, and followeth after me, is not worthy of me." Does not this cross of Christ try you, and find you wanting? Do fleshly ties and love of kindred prevent you? Christ has said: "If any one love father or mother, brother or sister, husband or wife, more than me, he is not worthy of me." Is it the reproach of the world and shame to be associated with the people of God because poor and moving in an humbler circle of society? Christ has said: He that is ashamed of me and of my word—and it is equally true of his people before men, of him will I be ashamed before my Father and the holy angels. Again: "Except a man deny himself, and take up his cross and follow me, he can not be my disciple." That I no more revere his name." See Liddell and Scott’s Greek and English Lexi­con, 6th edition. “Baptizo means to dip, to immerse. Sprinkling and pouring are out of the question.”—Chas. Anthor. Dr. L. Lange, a celebrated German Pedobaptist, says: “All attempts to make out infant baptism from the New Testament fail. It is utterly opposed to the spirit of the Apostolical Age, and to the fundamental principles of the New Testament.” —Infant Baptism, p. 101. Dr. J. P. Lange, the renowned commentator, says: “Would the Protestant church fulfill and attain to its final destiny, the baptism of new‑born children must be abolished. It can not, on any point of view, be justified by the Holy Scriptures.”—History Baptism, pp. 34, 35. My space does net permit me to discuss this state­ment here, but by no rules governing the Greek lan­guage can the original text be wrested to teach other­wise than that Paul laid his hands upon those who are said to have been baptized in this passage. This was ever the stronghold of our historical ancestors, when charged with re‑baptizing, until the time of Calvin.